The brewers of Almanac are experts at souring beers, and making beers with painfully low NSP. What this beer demonstrates is that they also know how to sour in moderation, and keep that NSP nice and low. What makes a gose different from, say, a Berliner-weisse? Salt. A gose is, simply, a goddamn-salty, slightly sour wheat ale. I'm sorry if that description sounds unappetizing, but that's where brewers' moderation becomes important: none of those traits (salty, sour, or wheat) should be used in excess, assuming you don't want "ale" which tastes like bile. GGG, I'd argue, lives in the moderation sweet-spot: there's a fine level of tartness layered over a very light-bodied wheat backbone -- not too much, but just a touch. Aromas are pleasantly citrusy, and fruity, which is very appetizing. And, yes, G^3 is salty. Almanac is known for sourcing local ingredients because, as their packaging usually reminds us, "beer is agriculture". Here they've used sea salt derived from San Francisco bay waters. Hmmm... I'm not so sure what I think about that. Is the bay clean? Not really. And it's not getting much better. (Check out this report from page 25 on.) But, whatever, I ain't scurred of no damn Methyl-mercury, or Selenium. I can see how most drinkers will simply not like this. There are too many 'strange' components in a widely under-brewed and under-drunk style. 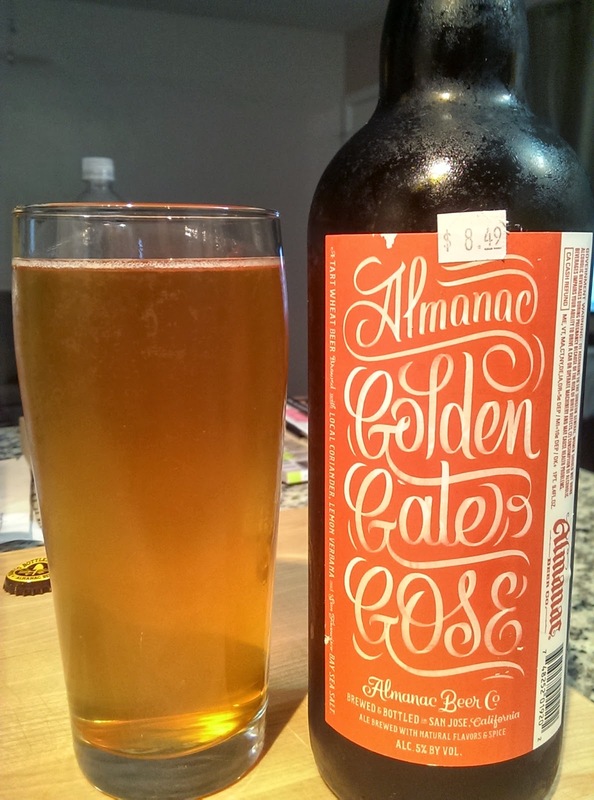 But Golden Gate Gose is absolutely killing it; even though I wish it was a lot cheaper, and in 12oz bottles, I'll still grab this any time.